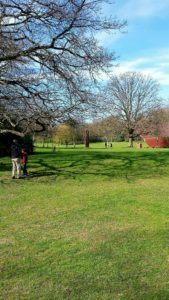 In a break from preparations for the Clapham Book Festival 2017 I hot- footed it over to Crystal Palace Park, where the Overground Festival will take place in June this year. I had never even been to this Park before and a visit was definitely necessary, to see just where the Storytelling Tent would be located and its position in relation to everything else. I and a number of others were led, in walking the site, by Grace Okereke, the manager of volunteers. 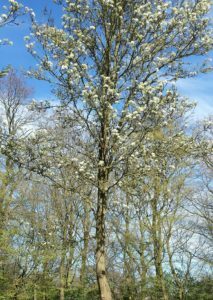 It was a glorious Spring day and the trees were in blossom. 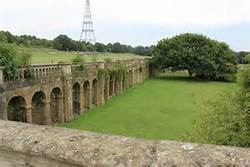 Crystal Palace Park was created to house the famous Crystal Palace, centrepiece of the 1851 Great Exhibition in Hyde Park, central London. 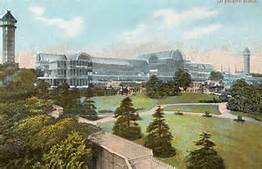 Sir Joseph Paxton who designed and built the Palace, wanted it to remain in Hyde Park but the government refused so he set up the Crystal Palace Company, which purchased the land which eventually became the Park and transported the Palace there, enlarging it on the way. There are lots of interesting aspects to the current park, even though the Crystal Palace burnt down in 1936. 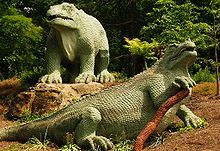 In the 1850s Benjamin Waterhouse Hawkins was commissioned to create a dinosaur sculpture park (dinosaurs had only recently been discovered and Charles Darwin himself gave the Park a gift of a dinosaur skull). When I was there I saw the Maze, which looked less formidable than it will in high summer, more like rows of vines in a vineyard than an impenetrable mass of green walls. The Maze will become the Storytelling Labyrinth during the Festival. I also saw the Italian Terraces, all that remain of the original Palace, in front of the tall aerial. This will be the backdrop for the Vintage Zone, with vintage clothing, furniture and book stalls and a small stage for music and dancing (of the vintage variety – Lindy Hop anyone, or the Twist ). The Spoken Word tent and the Book tent are near the main entrance, but the Storytelling tent is across the site, beyond the wooded cocktail bar, by the Crafts zone. The ground is grassy, rising gently to mature trees near by ( useful for shade if it is a hot and sunny day ). The hard cast path runs nearby too, so, if it is muddy ( just as likely given British Summers ) we can run a boarded path to the entrance of the tent. One has to think about every out-door eventuality. Walking the site was very useful and led me to make some changes, particularly in re-scheduling some of the performances. The opener was to be Jo Clayton, former storyteller in residence at the Globe Theatre, who was to begin at 11 o’clock. But, having walked from the main entrance to the tent, I realise that this was too early, Jo would be performing to a half empty tent because folk wouldn’t have got that far into the Festival ground by eleven. Thankfully Jo could change and do a later slot. So, if anyone does turn up at 11, they will find me, ready to read truncated stories from The Village – the more amusing ones perhaps. I doubt there will be much of an audience until later. Later, of course, I am doing a full-blown slot with Reconquista. This entry was posted in Culture Vulture, London and tagged Books, London, Worth a visit by juliej. Bookmark the permalink.